Any computer that was going to use a command line interface desperately needed a character set, and despite their ultimate monstrous graphical capabilities, Commodore’s machines were no exception. As was usually the case (cf. SHARPSCII, ATASCII) they adopted a flavour of the venerable ASCII character set standard (oddly choosing this time around a 1963 version rather than the updated 1967 revision most other platforms ran with) and added a few tweaks particular to their anticipated needs – much as Intellivision baked a set of “running man” sprites into ROM for general use by its developers, Commodore’s instructions for the PET designer Chuck Peddle and the son of its CEO Leonard Tramiel were to include shapes for card suits so as to facilitate easy BASIC production of conversions of card-based parlour games. But even after this spec was fulfilled, they still had a few extra spots left open in the character set (especially in its unshifted mode), and opted for reasons unknown to enrich it with a wealth of line-drawing characters and a handful of various shaded and unshaded boxes and fragments broken up at 90 and 45 degree angles, which yielded fertile ground down the line for such textmode artists as would opt not to take advantage of the C64’s renowned simplified hardware sprite-handling, instead drawing pictures using not vectors or bitmaps, but mosaic-like pointillism using individual fixed-width textmode characters as picture elements. Beyond its use in textmode BASIC programs run locally (got any twos? Go fish!) 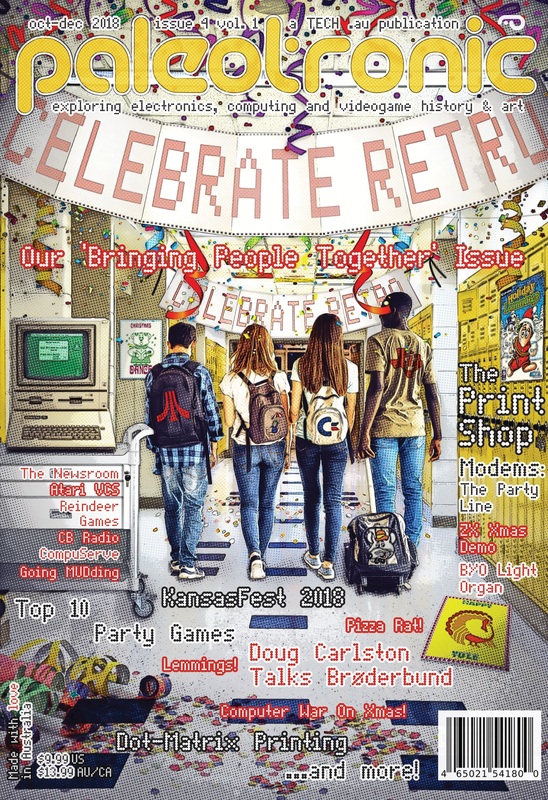 and floppy diskette file listing art, PETSCII found use on C64 bulletin board services, enhancing welcome splash screens, menus and interface elements (and even providing the backbone of primitive animations, chunky cartoons you could watch through your modem!) but failed to catch on quite like the PC’s later analogues of ANSI art and ANSImation due to the relatively slow transfer speeds (a leisurely 1200 baud for all but the most daredevil test-pilot users) of consumer-level modems during the Commodore 64’s period of market dominance in the home computer market. Enter the demoscene. In their singleminded drive of one-upmanship to milk surprising performance out of hardware from prehistoric times, any underexplored (undocumented ideally) hardware or software quirk represents a rich vein of mad props just waiting to be discovered…just sometimes you need to bottle the hardware up and allow it to ferment for a couple of decades before new modes of thought reveal the miracles that were hiding there in the silicon in plain sight the whole time. And what they have found (really, what they have always known, but really started taking to heart around 2011, after it had been steeping for some 34 years) is that PETSCII, divorced of its original context (slow modem speeds with a hard upper limit imposed by the floppy diskette controller the modem attached to), can prove to be a perfectly serviceable alternative to its younger sibling ANSI art where single-screen textmode art is concerned. Speaking of colours, PETSCII does experience the bane of the 8-bit display: colour clash if too many different foreground colours are used too near to each other, which needs to be carefully managed, tiptoed around or brazenly ignored. While PETSCII does offer two character sets – shifted and unshifted – artists must choose to use to sample exclusively from one or the other in their compositions, and never have the complete range of PETSCII character-combination possibilities at their disposal. Belgian textmode artist Otium of Galza straddles both worlds, equally fluent in ASCII and PETSCII, and notes that while there is a burden of additional constraints imposed while drawing textmode art on the C64, handcrafted textmode art is already a delicate exercise in elegantly working around constraints… so drawing in PETSCII can be understood to be in a sense a purer, more condensed version of the ANSI drawing experience, where further minimalism yields greater virtuosity! …if you are both interested in PETSCII and a devotee of vintage hardware, you probably already have strong opinions about which flavour is best suited for your particular needs. 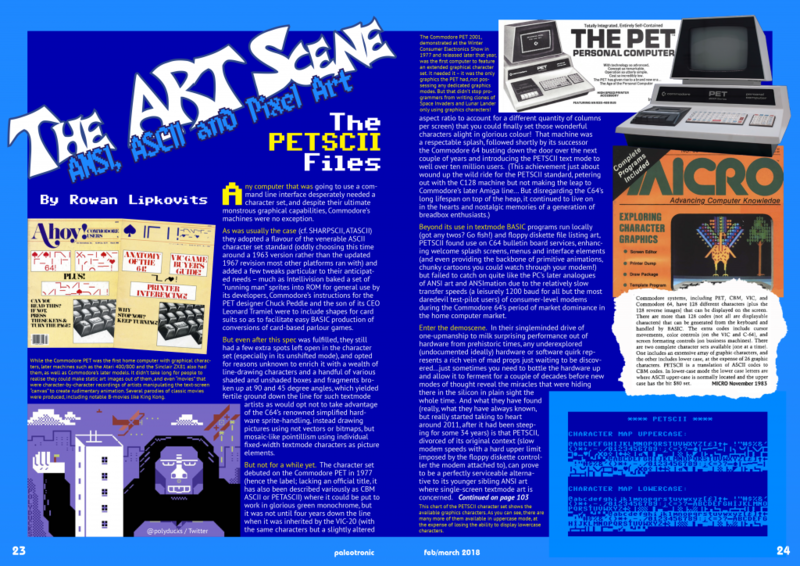 PETSCII has a compelling and distinct look, as can be testified to by the imitation of PETSCII limitations in C64 hirez graphics for purely aesthetic reasons, but for fans uninterested in committing to the constraints of emulation or vintage hardware use, operators of contemporary computers can take the PETSCII character set far with vectorpoem’s PLAYSCII drawing program and Grid Sage Games’ REXPaint, regularly driven to its limits by UK textmode artist Polyducks – but beware that what these programs output merely looks like PETSCII, and will not be intelligible back on the mothership! In addition to the PETSCII artists mentioned above, there are a number of further renowned and award-winning artists working in this medium. From within the demoscene, the curators of the Masters of Pixel Art books endorse the virtuous Scandinavians ilesj of Finland, Mermaid of Norway, and Redcrab and AcidT* of Sweden, plus the masterful Balkan strains of iLKke of Serbia and rexbeng of Greece. But lest you mistake it for a purely European phenomenon, you can also find PETSCII art practiced in very different ways from out of the demoscene’s shadow by PetsciiCola in Argentina and Ailadi in Shanghai, making for a truly global medium. The Commodore PET 2001, demonstrated at the Winter Consumer Electronics Show in 1977 and released later that year, was the first computer to feature an extended graphical character set. It needed it – it was the only graphics the PET had, not possessing any dedicated graphics modes. But that didn’t stop programmers from writing clones of Space Invaders and Lunar Lander only using graphics characters! While the PET was the first home computer with graphical characters, later machines such as the Atari 400/800 and the Sinclair ZX81 also had them, as well as Commodore’s later models. It didn’t take long for people to realise they could make static art images out of them, and even “movies” that were character-by-character recordings of artists manipulating the text-screen “canvas” to create rudimentary animation. Several parodies of classic movies were produced, including notable B-movies like King Kong. Contributor Rowan Lipkovits heads Vancouver computer arts group MiSTiGRis. Founded in 1994, MiST released art packs until 1998, then went on hiatus until returning with a 20th anniversary pack in 2014. After anniversary packs in 2015 and 2016, MiST returned to releasing monthly – 15 consecutive packs and counting. If you would like to contribute to a pack, join the Mistgris group on Facebook by searching for “Mistigris Computer Arts”.